Since the reports began to surface about the WWE approaching the wrestlers on the NXT UK brand with new contracts that would prevent them from working with other UK promotions that are not associated with the WWE, it made me think about the wrestling scene in New Zealand and Australia. By entertaining the thought of the WWE expanding their NXT system down under, I wondered how the WWE’s presence would influence our industry if they carried out the same alleged tactics that they imposed in the United Kingdom. To be fair, the story indicated that the new contracts came with a pay increase so that the talent would be compensated from the restrictions. This could be seen as the WWE strong-arming the non-affiliated UK promotions in a concerning attempt to conquer the territory. If this crusade ever eventuated down under, I believe that it would be best for New Zealand and Australia not to become colonies of the WWE, as colonialism always comes with a heavy price of losing one’s identity. Perhaps an NXT NZ brand would help relieve the financial burdens for many wrestling hopefuls and contribute to NZ’s modest industry which is underdeveloped compared to the UK and Australia. This, however, would Americanise NZ wrestling and decimate any chances of NZ wrestlers having some say over their characters. Rather, NZ and Australia would benefit as allies of New Japan Pro Wrestling. I use the term ally over colony based on how well our collective talent, Bad Luck Fale, Jay White, Toa Henare, and Robbie Eagles have performed successfully with New Japan while maintaining their cultural identities. I am reminded of the time when Shortland Street first appeared on television in 1992. We hated the sound of our own accent being spoken on prime time TV as we were searching for our identity after the nation decided to become less British decades earlier. It took years for New Zealanders to embrace our voice and likeness and to recognise Shortland Street for the many careers that it helped launch. 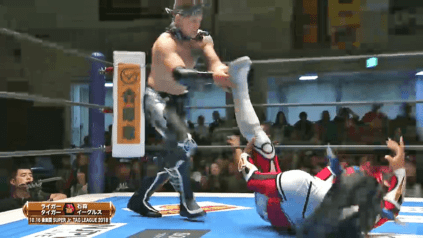 New Zealand wrestling should be cautious and keep an open mind of some of the long-term benefits that would come with being aligned with New Japan Pro Wrestling. Aside from being a direct affiliate of NJPW, the Dojo is proving to be a valuable asset to the wrestling profession. Through examples like Henare, Eagles and Fale’s endorsement of White and the Young Lions programme, the Dojo has been consistent in attracting students from around the world, even if we’re the last ones to acknowledge this feat due to our constant struggle with tall poppy syndrome. Wrestlers and fans alike have been conditioned to believe the narrative that the WWE is the only wrestling promotion that matters. 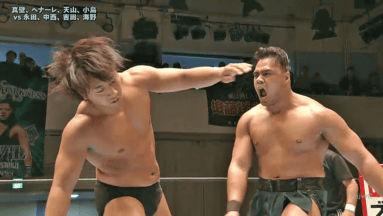 However, as Kiwis, our physical attributes make us more compatible with the Japanese strong style, just like we’ve been equipped to play rugby superior to most nations. New Zealanders are generationally built to compete in full-on contact sports, and this observation translates well over to the Japanese genre. Pardon my love affair and bias for New Japan, there’s absolutely nothing wrong with pursuing the WWE if that is your goal, but there are three New Zealanders and an Australian competing as members of New Japan’s world-class roster. They all have a difference in background and skills, yet there is a spot for each person to be featured authentically and prominently. Similar to how Steven Adams is giving back to an inclusive New Zealand with his basketball camps, Fale is building the same opportunities for Kiwis through professional wrestling. Fale and Adams share a willingness to promote New Zealand to the world and bring back the experience and accolades that they achieved in their respective sports to strengthen the wider community and show others a potential livelihood that is as reachable as becoming a rugby player or a doctor. It is because of leaders like Fale while collaborating with NJPW that the NZ and Australian wrestling circuits would flourish and retain ownership of its identity. Although NXT put on some thrilling events, it is still regarded as a development territory. This means that the journey of many NXT stars concludes when they’re called up to the WWE where most of them become lost. Wrestling hopefuls throughout NZ and Australia who may be serious in wanting to become full-time wrestlers beyond their surroundings should consider Fale Dojo as the foundation for their training, and they should also begin to recognise this important landmark for what it truly is, the leading wrestling training school in the southern hemisphere. Quite possibly the most accurate and honest assessment of the scene I’ve ever read!